Over 7.5 million people became naturalized U.S. citizens over the past 10 years. Yet there are millions more eligible permanent residents (green card holders) that don’t take the next step because they’re worried about the citizenship test and interview. You can do it. In fact, many resources are available to help you prepare for the U.S. citizenship interview and test. 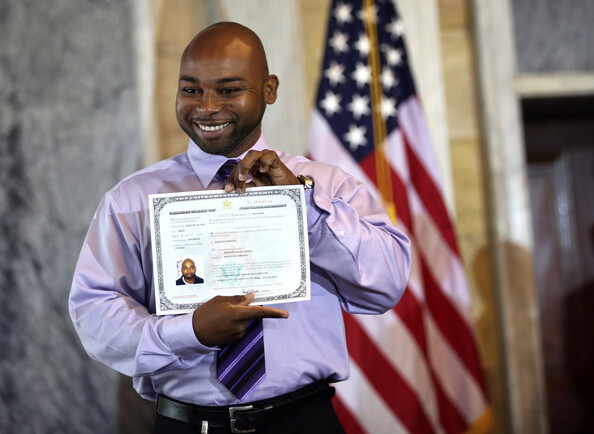 When you know what to expect and do some preparation, you can become a U.S. citizen. The interview and test happen near the end of the naturalization time line. Review your N-400 application carefully before attending the appointment. The USCIS officer will use the application to test your English and to confirm that the information you have given is correct. If there are any differences between answers on application and your supporting documents, be prepared to explain the reason. Likewise, you should be prepared to offer any additional information. For example, you’ll need to provide details of your time outside the United States if you took a recent trip abroad. Your ability to understand the questions and answers in English is part of the interview. If you have traveled abroad for a period of greater than six months. If you have been arrested for certain crimes or otherwise interfered with the good moral character requirement. If you have recently divorced the U.S. citizen who sponsored you for a green card and your eligiibility is based on three years of marriage to that person. In these situations, we highly recommended that you consult with an immigration lawyer before attending the naturalization interview. Remember, your ability to understand and speak English will be evaluated from the moment the USCIS officer meets you. If you don’t understand a question, it’s okay to ask the officer to rephrase it. Speaking. Your ability to speak English is determined by your answers to questions normally asked by USCIS officers during the naturalization eligibility interview on Form N-400. Several FREE study tools are available from USCIS to help you prepare for the English test. Easy-to-use flash cards containing vocabulary words to help study for the English reading portion of the test. Easy-to-use flash cards containing vocabulary words to help study for the English writing portion of the test. Official list of vocabulary for the English reading portion of the citizenship test. This listening activity has commands that you may hear during the citizenship interview. Download the self-study flash cards to practice on your own. This reading activity has words and phrases that you may read on the Application for Naturalization, Form N-400, or hear during the citizenship interview. This reading and listening activity has words and phrases that you may read on the Application for Naturalization, Form N-400, or hear during the citizenship interview. You will also be given a civics test in English (to test your knowledge and understanding of U.S. history and government) unless you are exempt. Even if exempt from the English test, you will need to take the civics test in the language of your choice or qualify for a waiver. There are 100 civics questions on the U.S. citizenship test. During your test, you will be asked up to 10 questions from the list of 100 questions in English. You must answer correctly six of the 10 questions to pass the civics test in English. Several FREE study tools are available from USCIS to help you prepare for the history/civics portion of the test. Online videos and activities highlight museum objects from the Smithsonian Institution to help you prepare for the civics portion of the citizenship test. Practice your knowledge of U.S. history and government with these 4 different self-tests. This is 1 of 4 practice tests available for you to try. Easy-to-use downloadable flash cards containing each of the 100 civics (history and government) questions and answers on the citizenship test. Short video providing an overview of the naturalization process and test. Video highlighting U.S. history, civics, and the rights and responsibilities of citizenship. Study booklet containing short lessons based on each of the 100 civics questions and answers on the test. There are exemptions and modifications to the naturalization requirements that are available to certain individuals who qualify. Age 55 or older at the time of filing Form N-400 and have lived as a permanent resident in the United States for 15 years or more. This is also known as the “55/15” exception. Bring an interpreter with you to your interview. If you are age 65 or older and have been a permanent resident for at least 20 years at the time of filing for naturalization, you will also be given a simplified version of the civics test. If you have a physical or developmental disability or mental impairment that prevents you from demonstrating your knowledge and understanding of the English language and/or civics requirements for naturalization, you may qualify for an exemption to certain parts of the naturalization test. You must submit an original Form N-648, Medical Certification for Disability Exceptions, at the time of filing Form N-400. The Form N-648 must have been prepared by a licensed medical or osteopathic doctor or licensed clinical psychologist less than six months prior to filing Form N-400. After you file Form N-400, Application for Naturalization, begin keeping a file that includes a copy of the application, all of the supporting documentation that was submitted with your application, and any letters you receive from USCIS. This will make it easier to find and review the information before your interview. Download the PDF below for a list of items typically required at the citizenship interview, but read your appointment notice for any additional documents that you might need. How early should I arrive to my naturalization interview? There’s no need to arrive more than 15-20 minutes early to the naturalization interview. In addition to it being an unfamiliar location, there will be a security checkpoint at the USCIS building that you attend. So give yourself some extra time. Upon checking in for your naturalization interview, you’ll probably have a wait. USCIS offices generally schedule people in blocks of time. You may be called at the beginning or the end of the block of time. Nonetheless, don’t show up at the last minute. Get there early. You may need the time to find parking, navigate a new building and get through security. If you fail to show up on time, USCIS could decide to close your case file. What should I wear the interview and test? It’s not necessary to dress formally for your U.S. citizenship interview and test. You may dress comfortably but look professional. “Business casual” is a good rule of thumb. Avoid wearing jeans, shorts and t-shirts. A nice collar shirt or blouse for women is sufficient. Of course, you are welcome to wear a suit and tie if that’s what makes you comfortable. What if I don't pass the civics portion of the naturalization test? If you are unable to answer six of 10 questions correctly, the interview will stop, and you will be rescheduled for another day (within the next 90 days). You will have one additional chance to pass the citizenship test. If you are unable to pass the test during the second attempt, your N-400 will be denied. Will the USCIS officer tell me if I passed? If all goes well at the U.S. citizenship interview and test, the USCIS officer will tell you that you have been approved and may hand you a piece of paper containing information about your oath ceremony. If USCIS is not able to immediately schedule you for the ceremony, they will mail you another notice with the place and time of the oath ceremony. You do not officially become a U.S. citizen until you take the oath.